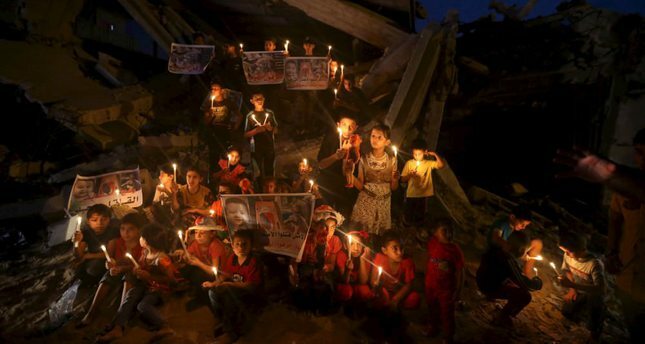 Palestinian children light candles during a rally to remember 18-month-old Palestinian Ali Dawabsheh who was killed after his family's house was firebombed in an attack by suspected Jewish extremists. Police have opened an investigation into online threats against Israel's president following his condemnation of "Jewish terrorism" after a firebombing killed a Palestinian toddler, a presidential spokesman said on Monday. President Reuven Rivlin had written a Facebook post following Friday's arson attack by suspected Jewish extremists on a Palestinian family's home in the West Bank village of Duma. The attack killed 18-month-old Ali Saad Dawabsha and critically injured his parents and four-year-old brother. "More than shame, I feel pain," Rivlin wrote in Arabic and Hebrew. "The pain over the murder of a little baby. The pain over my people choosing the path of terrorism and losing their humanity. Their path is not the path of the State of Israel and is not the path of the Jewish people. Unfortunately, it seems that so far we've dealt with the phenomenon of Jewish terrorism limply," he wrote, calling for concrete measures against such extremists. Rivlin's post evoked a wave of more than 2,000 comments, some positive but others attacking him and recalling Israelis killed by Palestinians. "Dirty traitor. Your end will be worse than [Ariel] Sharon's," said one commenter quoted by the Maariv newspaper, referring to the late Israeli former prime minister who spent eight years in a coma. Another said: "In Russia you would have been found by this point cut up inside a shoe box." Police said they had received material from the president's security team and had ordered an investigation to "examine offensive publications against the president on social media." The state prosecutor launched a separate probe into two YouTube videos showing Rivlin and Prime Minister Benjamin Netanyahu in Nazi uniforms speaking German. In 1995, then Prime Minister Yitzhak Rabin was gunned down at a peace rally in Tel Aviv by a Jewish extremist after a campaign of right-wing incitement against a peace deal with the Palestinians. Rabin's daughter, Dalia, told military radio she was "sickened" by the videos. Meanwhile, a Jewish extremist group's leader was arrested Monday after the Palestinian toddler died in the West Bank firebombing, as police investigated online threats against Israel's president for condemning "Jewish terrorism." The domestic intelligence service named him as Meir Ettinger, a grandson of Meir Kahane, a rabbi who founded the racist anti-Arab Kach movement and who was assassinated in 1990 in New York. He was arrested in Safed in northern Israel "because of his activities in a Jewish extremist organization," a Shin Bet spokesman told Agence France-Presse (AFP). Police said Ettinger, who is around 20, was suspected of "nationalist crimes" but did not accuse him of direct involvement in Friday's firebombing. According to Israeli media, he was the brains behind a June 18 arson attack on a shrine in northern Israel where Christians believe Jesus performed the miracle of loaves and fish. Ettinger was due to appear in court yesterday for a custody hearing, police said. Media reports said Ettinger could face a year of "administrative detention" under the government's harder line against "Jewish terrorists." On his blog, Ettinger has in past days denied the existence of an underground Jewish organization, but has defended attacks on "crimes" such as the existence of churches and mosques branded as "places of pagan worship." Palestinians on Monday submitted a request to the International Criminal Court to probe the firebombing and "settler terrorism," their Foreign Ministry in the West Bank city of Ramallah said. The continuing tension between Palestine and Israel is worsening following the toddler's death.